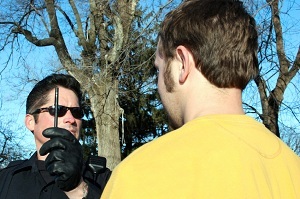 During a traffic stop, it is the police officer’s responsibility to look for signs of intoxication. The officer will try to notice if there is any alcohol visible in the vehicle. He or she will listen for slurred speech and attempt to detect the odor of alcohol on your breath. If there are any signs that you may be intoxicated, you may be asked to perform a few field sobriety tests. How you perform in the tests may lead to a breath test or a trip to the station for an official blood test. There are a number of mistakes that can be made during a field sobriety test in California. Was the test given on an uneven surface? A couple of the series of tests involve balance challenges. When these tests are taken on cracked or uneven surfaces, even a sober suspect may struggle to appear coordinated. It is also important to determine the ability of the officer to accurately conduct the tests. The Horizontal Gaze Nystagmus test requires officers to carefully watch for an involuntary jerking of the eye. Only a trained professional can truly notice the difference between a smooth and jerking eye, and there are many medical conditions that can make this test an inaccurate way to prove intoxication. Authorities look for signs of intoxication before deciding whether or not to bring someone to the station on suspicion of driving under the influence. Sometimes an officer only needs to smell alcohol or see an open container in the vehicle to make an arrest. Other times, an arresting officer may conduct a field sobriety test. Drivers may be asked to walk a straight line or stand on one leg while counting. Others may have to follow an object back and forth while the officer examines their eye movement. These tests can prove useful for the arresting officer but there are many errors that can be made during the execution of these tests and those errors sometimes lead to wrongful charges. One of the inherent problems with field sobriety tests in California and throughout the U.S. is that they do not take into account the fact that some people cannot pass them even when sober. Some medical conditions may cause a person to fail the horizontal gaze nystagmus test even if they haven’t been drinking. When a police officer suspects a driver of being under the influence of drugs or alcohol, they may conduct field sobriety tests (FSTs). There are a number of non-standardized tests that an officer may administer, but there are three main tests that most officers conduct in the course of a DUI traffic stop. Horizontal Gaze Nystagmus Test: A police officer will hold up an object, usually a pen, or a finger and ask the driver to follow the object with their eyes back and forth. By carefully watching the driver’s eyes, the police officer will attempt to discover a bouncing of the eye. This bouncing is called horizontal gaze nystagmus. In some DUI cases, observing unsmooth eye movements or early onset may mean the driver has been drinking. This test is subject to the training and ability of the officer giving the test. Technically, only an ophthalmologist can truly administer this test and there are many other naturally occurring conditions besides alcohol that may cause nystagmus. Walk and Turn: In this test, the driver will be asked to take nine steps, pivot and then walk back. While walking heel-to-toe, the driver will have to count the steps out loud. Someone who is significantly inebriated will have difficultly balancing while walking and may make mistakes while counting. But even if the driver just needs to hold out their arms to balance or they count wrong, the officer may deem it a failed test and charge them with a DUI case.